From card to wallet, card-to envelope, card to box, card to shoe, to card to... well, you get the picture. All magicians know the strongest magic happens in the hands of the spectator... UNSEEN does just that! 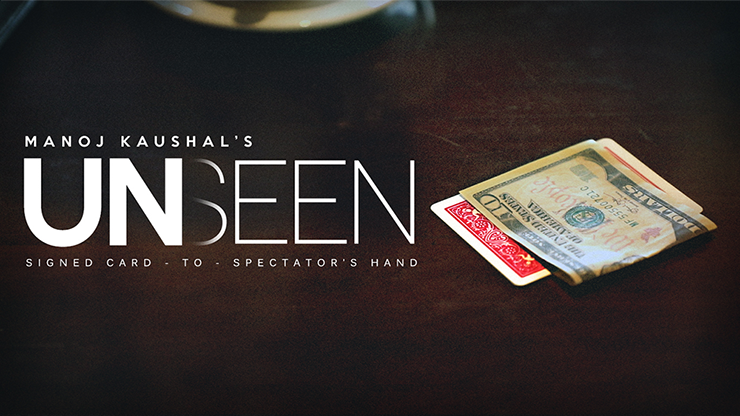 You borrow a dollar bill (or any paper/plastic currency) from a spectator and you place their folded bill on a table. Next, you ask them to place their hand on top to make sure you don't ever come near it! They choose ANY CARD and SIGN their name on it. The card is then lost in the deck or for that matter, completely vanishes!! You ask them to slowly lift their hand and, inside, they find THEIR card wrapped inside THEIR bill!